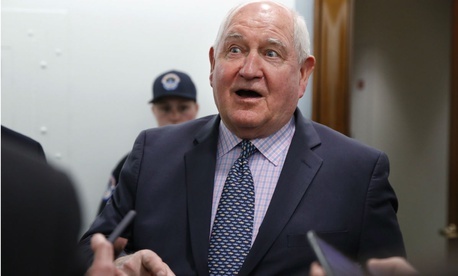 Despite criticism, Agriculture Secretary Sonny Perdue is proceeding apace with plans announced in August to move two major sub-agencies outside of Washington and force many employees to relocate (at government expense) or take buyouts. On Thursday, the USDA Deputy Assistant Secretary for Administration Donald Bice placed a notice in the Federal Register extending by 30 days (until Oct. 15) the period in which localities (along with industry and academic parties) can declare interest in becoming the new site for the department’s National Institute of Food and Agriculture and Economic Research Service. Both are currently in Washington, D.C., in General Services Administration space. The move would take place by the end of 2019, and include reinserting the Economic Research Service into the Office of the Chief Economist within the secretary’s office. The space needed for 360 NIFA employees is 90,000 square feet and the space required for 260 ERS employees is 70,000 square feet, the notice said. The criteria for the new spots include proximity to an airport, commuting options for employees, technology infrastructure, capital and operating cost, and community/quality of life considerations. Defenders of the changes also noted that ERS was part of the economist’s office before separating in 1994. In the past month, the plan has drawn criticism from lawmakers as well as employees, two of which spoke to Government Executive with their own opinions on condition of anonymity. On Aug 30, four Democrats on the House Agriculture Appropriations panel wrote to Perdue expressing concern about lack of employee input on the moves. “It worries us to hear reports that USDA’s reorganization announcement has jeopardized morale not only in the two affected agencies, but all across the department as employees wonder whether other agencies will be relocated,” wrote Reps. Rosa DeLauro, D-Conn.; Mark Pocan, D-Wis.; Sanford Bishop, D-Ga.; and Chellie Pingree, D-Maine. They asked for data on hiring for five years, estimated savings from the changes and recruitment times, a timeline, estimated moving costs and expected loss in current staff. Norton called on appropriators to include a provision in the pending agriculture spending bill to prohibit USDA from carrying out the move. Employees learned of the move in abrupt stages, one told Government Executive in mid-September. One August morning, staff were told that the office head was moving to a different agency, and after lunch came an email from Perdue on the relocations. The real motive, many in the USDA community believe, is “to reduce the size of government in any way possible, and reduce the scientific capabilities of the organizations—it’s the research they’re going after,” the employee said. There are about 300 at ERS and about 400 at NIFA, so the move as spelled out in the Federal Register notice would assume the loss of roughly 40 employees at each agency. A second ERS employee told Government Executive he and his wife might be willing to take “an adventure” by moving, depending on the new location, and he said that his working relationships with the new Trump administration appointees have been good. “But I feel for the younger guys with families and kids in school and who just bought a new house,” he said. Overall, “This is terrible news, and is effectively going to seriously downgrade the size of the place and the mission and resources,” he added. If the move occurs, it “will threaten our independence,” he said. The role of ERS is to provide “objective hands-off, policy-relevant research not connected to programs. They can’t come to us and say, ‘We want this answer,’ ” he said. The Trump appointees, however, “are not interested in moving us—they’re interested in getting rid of us,” he said. Perhaps, he said, it’s because some of the agency’s work addresses such controversial regulatory issues as climate change, healthy eating and food safety.